For IF: What is we pretend that tree wear shoes? This drawing was done with graphite on coquille paper. One of my themes involves blending human elements with the plant world. 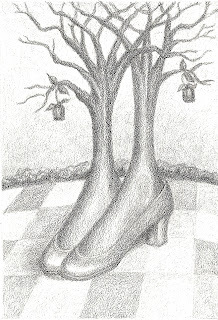 In this drawing, the human element has been reduced to a pair of shoes with trees growing out of them. Oh, this is marvelous! I love the detailing you put in every piece you create! Nice work, and I really enjoy your concept. Unique! There's no place like home? Nice thoughtful piece.